It all started one Sabbath morning with a teen crying behind a locked bedroom door. Gently knocking on her daughter’s door, Mrs. Shin asked what was wrong. Mrs. Shin had noticed for some time that her 15-year-old daughter, Bo Hwa, wasn’t happy. During the week, Bo Hwa was away at school with many friends, but at home she was the only teen in church. Mother and daughter prayed together about the situation, and before long Mrs. Shin had a plan. Every weekday morning, she arose very early and made 2,000 hotteoks—a popular sweet-filled Korean pancake. Mrs. Shin then took her hotteoks and set up shop directly across from the local high school. Before school, through lunchtime, and after school, Mrs. Shin sold hotteoks to the hungry students. But she did much more than that—she befriended them. This was the first time anyone had shown a genuine interest in many of her young customers. Sensing her trustworthiness, the students began opening up to Mrs. Shin. Many were having a difficult time at school and at home. Several came from broken homes or abusive situations. Some were living on their own. As trust deepened, Mrs. Shin decided to take their friendship to the next level. “What are you doing on Saturday afternoon?” she asked her daily customers. “Nothing,” was the usual response. “Would you like to come with me to visit some elderly people and cheer them up?” she asked. Earlier, Mrs. Shin had visited the local government office, asking for the names and addresses of elderly people who had no family caring for them. Every Sabbath afternoon, Mr. and Mrs. Shin, Bo Hwa, and numerous high school students visited the elderly. The activity was an instant success! Following the visits, Mrs. Shin invited the students to her home for a feast. The students loved the food and felt at home, sensing the warmth and caring of the Shin family. Bo Hwa was excited to have many new friends. In addition to providing physical food, the Shins taught the students how to pray, sing Christian songs, and study the Bible. During the week, besides selling hotteoks, Mrs. Shin visited the homes of the students, bringing food to those who were living alone. When situations were especially challenging, the Shins would bring the young people into their home, caring for them as their own. Attendance at the Sabbath afternoon meetings grew until the Shin’s small 700-square-foot (65-square-meter) apartment couldn’t hold any more people. The group then met temporarily in Mr. Shin’s nearby electrical shop, until neighboring shopkeepers complained. The Shins continued praying, and soon God provided an opportunity for them to move into a larger home, allowing them to “adopt” more young people and provide a larger place to meet on Sabbath afternoons. After a while, it became clear that their “home church” had grown into a church plant. Realizing that it would be best for them to officially organize as a Seventh-day Adventist Church, the Shins prayed earnestly to find an affordable building that could serve as their church. The Lord answered that prayer, and $5,000 was raised to purchase the house. The group then worked together repairing and renovating the building into a place for worship. However, they needed a pastor. Wanting to encourage the young people to have a better life by continuing their education, Mr. Shin set an example. Although 45 years old, he told them he was willing to go back to school if they were. Mr. Shin was accepted at Sahmyook University, a large Adventist university near Seoul, where he enrolled in theology. He, Bo Hwa, and three of the “adopted” children completed university studies—all funded from the proceeds of Mrs. Shin’s hotteok business! Since this church plant began in 1998, more than 400 young people have been baptized. Members of the church, which consists nearly entirely of young people, have presented 39 evangelistic programs (as of April 2014). They have gone on mission trips to Cambodia, Hong Kong, the Philippines, and Taiwan, transforming thousands of lives in these Asian countries. 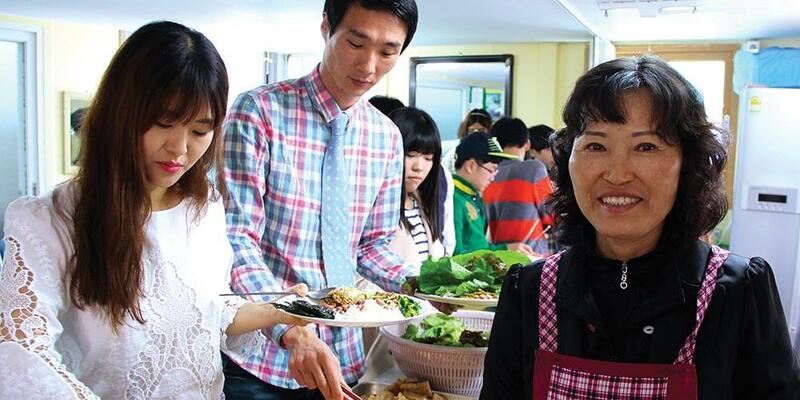 A portion of your Thirteenth Sabbath Offering for the second quarter of 2015 will help to build the Saebyeoksei Mission Institute for Youth in Naju, South Korea, where these young members can receive additional training and continue the tradition of church planting. Thank you for your generous offering!